Loki (pronounced “LOAK-ee;” Old Norse Loki, the meaning of which will be discussed below) is the wily trickster god of Norse mythology. His familial relations attest to this. His father is the giant Farbauti (Old Norse Fárbauti, “Cruel Striker”). His mother is Laufey (the meaning of which is unknown) or Nal (Nál, “Needle”). Laufey/Nal could be a goddess, a giantess, or something else entirely – the surviving sources are silent on this point. Loki is the father, by the giantess Angrboda (Angrboða, “Anguish-Boding”), of Hel, the goddess of the underworld; Jormungand, the great serpent who slays Thor during Ragnarok; and Fenrir, the wolf who bites off one of the hands of Tyr and who kills Odin during Ragnarok – hardly a reputable brood, to say the least. As we’ll see below, Loki demonstrates a complete lack of concern for the well-being of his fellow gods, a trait which could be discerned, in vague outline, merely by considering these offspring of his. 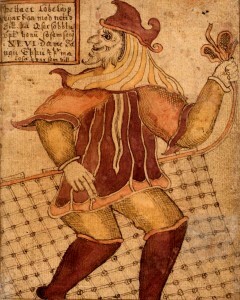 Loki often runs afoul not only of societal expectations, but also of what we might call “the laws of nature.” In addition to the progeny listed above, Loki is also the mother – yes, the mother – of Sleipnir, Odin’s shamanic horse, whom Loki gave birth to after shapeshifting into a mare and courting the stallion Svadilfari, as is recounted in the tale of The Fortification of Asgard. In the tales, Loki is portrayed as a scheming coward who cares only for shallow pleasures and self-preservation. He’s by turns playful, malicious, and helpful, but he’s always irreverent and nihilistic. For example, in the tale of The Kidnapping of Idun, Loki, by his recklessness, ends up in the hands of a furious giant, Thiazi, who threatens to kill Loki unless he brings him the goddess Idun. Loki complies in order to save his life, and then finds himself in the awkward position of having the gods threaten him with death unless he rescues Idun. He agrees to this request for the same base motive, shifting his shape into that of a falcon and carrying the goddess back to Asgard in his talons. Thiazi pursues him desperately in the form of an eagle, but, having almost caught up with Loki as he nears his destination, the gods light a fire around the perimeter of their fortress. The flames catch Thiazi and burn him to death, while Idun and Loki reach the halls of the gods safely. Loki ultimately comes to the aid of the gods, but only to rectify a calamity for which he himself is responsible. This theme is repeated in numerous tales, such as in The Creation of Thor’s Hammer and the aforementioned The Fortification of Asgard. After Thiazi’s death, the giant’s daughter, Skadi, arrives in Asgard demanding restitution for the slaying of her father. One of her demands is that the gods make her laugh, something which only Loki is able to do. To accomplish this, he ties one end of a rope to the beard of a goat and the other end to his testicles. Both he and the goat squawk and squeal as one pulls one way and the other pulls the other way. Eventually he falls over in Skadi’s lap, and the giantess can’t help but laugh at such an absurd spectacle. Here, Loki once again comes to the aid of the gods, but simply by being silly and outlandish, not by accomplishing any feat that a Viking Age Scandinavian would have found to be particularly honorable. Loki alternately helps both the gods and the giants, depending on which course of action is most pleasurable and advantageous to him at the time. During Ragnarok, when the gods and giants engage in their ultimate struggle and the cosmos is destroyed, Loki joins the battle on the side of the giants. According to one Old Norse poem, he even captains the ship Naglfar, “Nail Ship,” which brings many of the giants to their battle with the gods. When the battle for the world is fought, he and the god Heimdall mortally wound each other. Loki is perhaps best known for his malevolent role in The Death of Baldur. After the death of the beloved god Baldur is prophesied, Baldur’s mother, Frigg, secures a promise from every living thing to not harm her son. Well, almost everything – no such oath is obtained from the mistletoe, which the gods think too small and safe a thing to harm Baldur. Upon discovering this omission, Loki carves a mistletoe spear, places it in the hands of the blind god Hod, and instructs him to throw it at Baldur. Hod, not knowing the origin of the weapon, complies, and Baldur is impaled and dies. The god Hermod rides Sleipnir to the underworld and implores Hel to release Baldur, pointing out how beloved he is by all living things. Hel retorts that if this is so, then it shouldn’t be difficult to compel every being in the world to weep for Baldur, and, should this happen, the dead god would be released from the grave. Every living thing does indeed cry for Baldur’s return, with one sole exception: a frost-hearted giantess named Tokk (Þökk, “Thanks”), who is almost certainly Loki in disguise. So Baldur must remain with Hel. For his many crimes against them, the gods eventually forge a chain from the entrails of Loki’s son Narfi and tie him down to three rocks inside a cave. A venomous serpent sits above him, dripping poison onto him. Loki’s apparently very faithful and loving wife, Sigyn, sits at his side with a bowl to catch the venom. But when the bowl becomes full, of course, she has to leave her husband’s side to pour it out. When this happens, the drops of venom that fall onto him cause him to writhe in agony, and these convulsions create earthquakes. And in this state he lies until breaking free at Ragnarok. A fascinating variant of the tale of Loki’s being bound comes to us from the medieval Danish historian Saxo Grammaticus. In his History of the Danes, Thor, on one of his many journeys to Jotunheim, the homeland of the giants, finds a giant named Útgarðaloki (“Loki of the Utgard“). 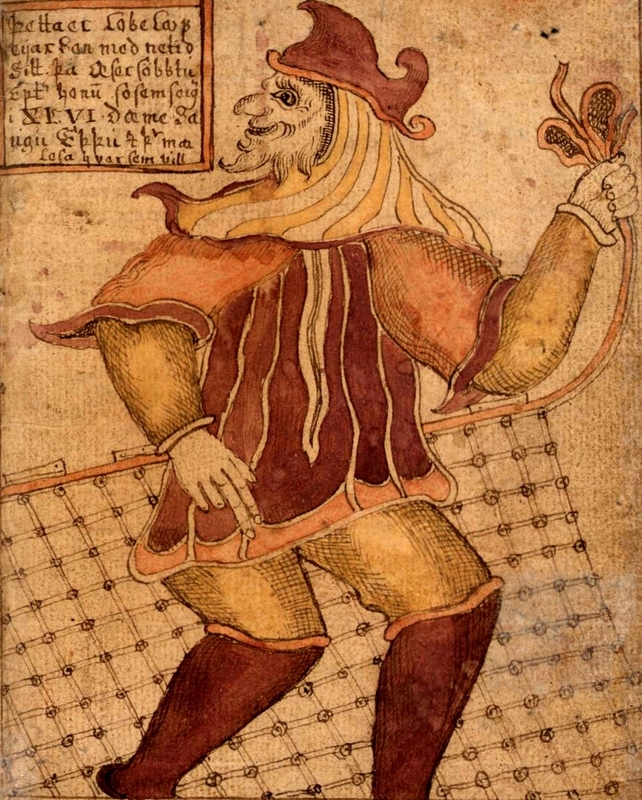 Útgarðaloki is bound in exactly the same manner as that in which Loki is bound in the tale mentioned above, which comes from Icelandic sources. It seems that even the pagan Scandinavians themselves held conflicting views on whether Loki was a god, a giant, or something else entirely. This proposed meaning of Loki’s name powerfully resonates with his role in Norse mythology in two ways. First, it points to his role as a maker of nets, both literal fish nets and metaphorical “nets” in the form of his cunning schemes that trap the gods in perilous situations. Second, it could indicate his being the “knot” in the otherwise straight thread of the gods and their world, the fatal flaw that ultimately brings about their demise. Even though Loki is in some sense a god, no traces of any kind of worship of Loki have survived in the historical record. Is this any wonder, given that his character is virtually the antithesis of traditional Norse values of honor, loyalty, and the like – and that he is ultimately a traitor to the divinities the Norse held in such reverence? Turville-Petre, E.O.G. 1964. Myth and Religion of the North: The Religion of Ancient Scandinavia. p. 127. Heide, Eldar. 2009. More Inroads to Pre-Christian Notions, After All? The Potential of Late Evidence. In Á austrvega: Saga and East Scandinavia: Preprint Papers of the 14th International Saga Conference. Edited by Agneta Ney et al. p. 363. Simek, Rudolf. 1993. Dictionary of Northern Mythology. Translated by Angela Hall. p. 284. The Poetic Edda. Völuspá, stanza 51. Saxo Grammaticus. 1905. The History of the Danes. Book VIII. Turville-Petre, E.O.G. 1964. Myth and Religion of the North: The Religion of Ancient Scandinavia. p. 138. Heide, Eldar. 2012. p. 90-91. Loki, the Vätte, and the Ash Lad: A Study Combining Old Scandinavian and Medieval Material. In Viking and Medieval Scandinavia 7. Simek, Rudolf. 1993. Dictionary of Northern Mythology. Translated by Angela Hall. p. 195.